I love getting manicures and pedicures, but I’m nervous that the lamps used in nail salons to dry my nails emit radiation. Do they? They do. 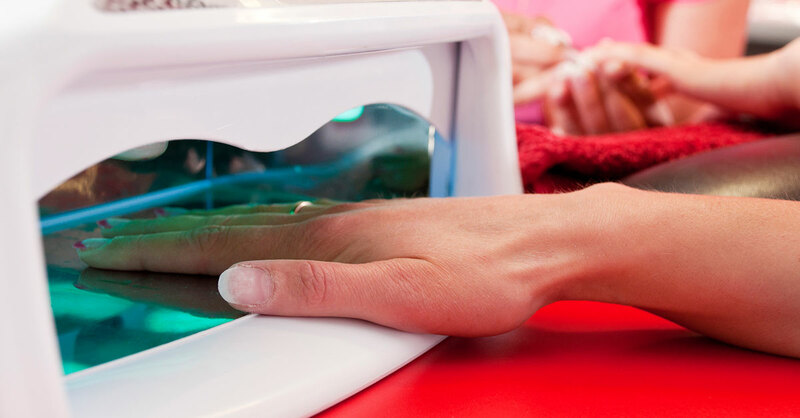 Both the ultraviolet (UV) lamps and the LED lamps used in nail salons to speed-dry nails emit UV radiation. These lamps predominately produce UVA rays, which have been linked to both premature skin aging (such as age spots and wrinkling) as well as skin cancer. While you spend just a limited amount of time under the lamps, if you’re getting manicures on a weekly basis, that exposure adds up. That said, even the most intense of these lamps present only a moderate UV risk–far lower than the risk of using a tanning bed, for example, or spending extended time outdoors without sun protection. While using nail lamps occasionally is not a cause for alarm, you should be aware of the risk and minimize UV exposure–from all sources–whenever you can. That’s particularly true if you are taking any medications—including certain antibiotics, such as tetracycline, or a diuretic, such as furosemide (Lasix)—or have a medical condition, such as lupus or psoriasis, that makes your skin extra-sensitive to the sun. Consult your physician to find out if your medication or a medical condition you may have could make your skin photosensitive. Your best bet is to let nails air dry. However, if you’re getting a gel manicure, using the nail lamp is necessary to ensure that the polish sets properly. Protect your hands by applying a broad-spectrum (UVA and UVB protection) sunscreen 20 minutes before using the lamp or cutting the fingertips off an old pair of gloves and putting them on before your manicure. (Keep the sunscreen off your nails, as it could interfere with the application of polish.) But keep in mind that your nails will still be unprotected (squamous cell carcinoma is often found underneath the nail plate). For that reason, keep gel manicures to a minimum. Does Having Skin Cancer Mean You’ll Get Other Cancers? Quiz: What Do You Really Know About Skin Cancer?